SupraStore Brand Parts - ONLY ONE LEFT IN STOCK AT THIS PRICE!!! 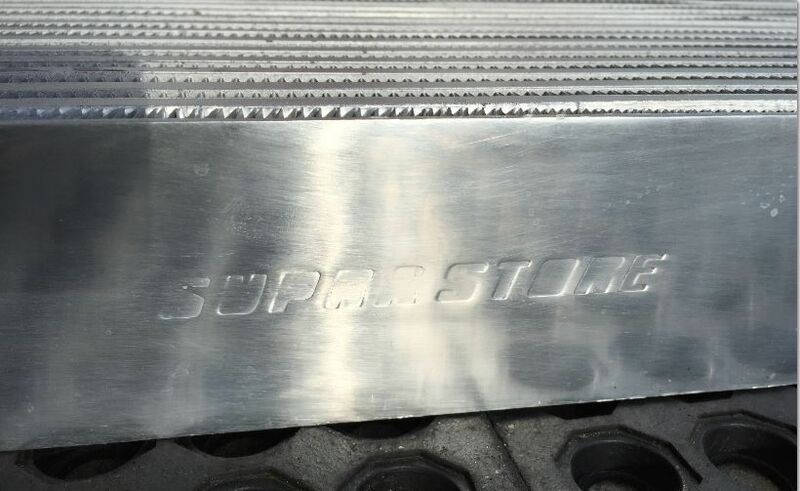 The SupraStore.com front mount intercooler kit for the 1993-2002 Supra Twin Turbo is one of the single best bargains we have ever offered here, period. 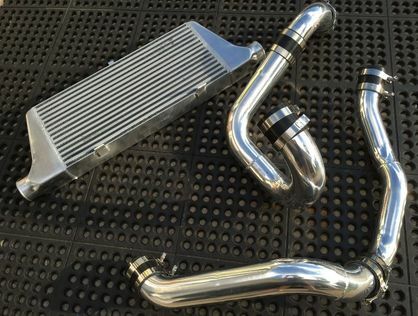 Consisting of a polished 3" deep (600mm x 300mm x 75mm) front mount intercooler with aluminum hard pipe kit; black couplers and t-bolt stainless steel clamps and the remote radiator overflow bottle kit, all for under $700? Yes, that is the case! We have teamed up with the guys in the shop again to offer a budget kit worthy of the Supra. Good for 750HP, this kit is all you need for the install using your stock twins or with any turbo using the stock twin routing. This can be run with a single turbo, with the only change needed is the outlet intercooler piping. Designed to offer minimal pressure drop across the core, this is the ultimate budget intercooler, worthy of the Supra. 24" wide x 12" high x 3" deep with 3" inlets and nearly 3" diameter piping to minimize lag. 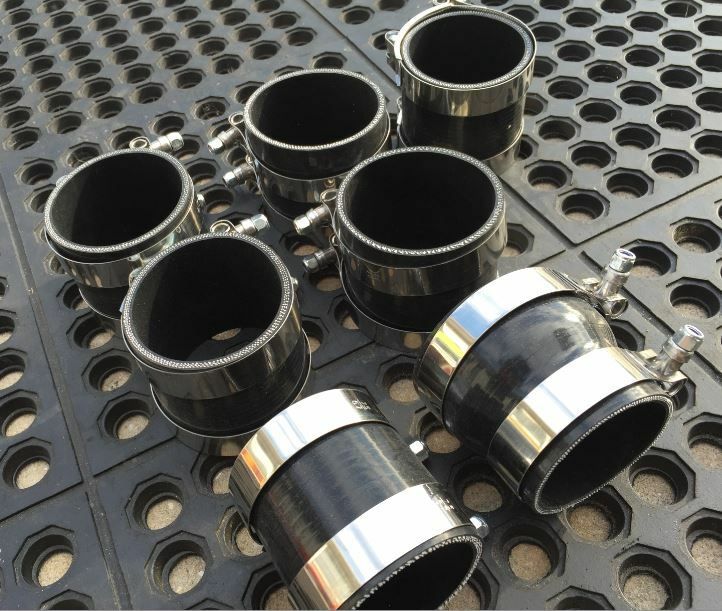 All t-bolt clamps, hose couplers. 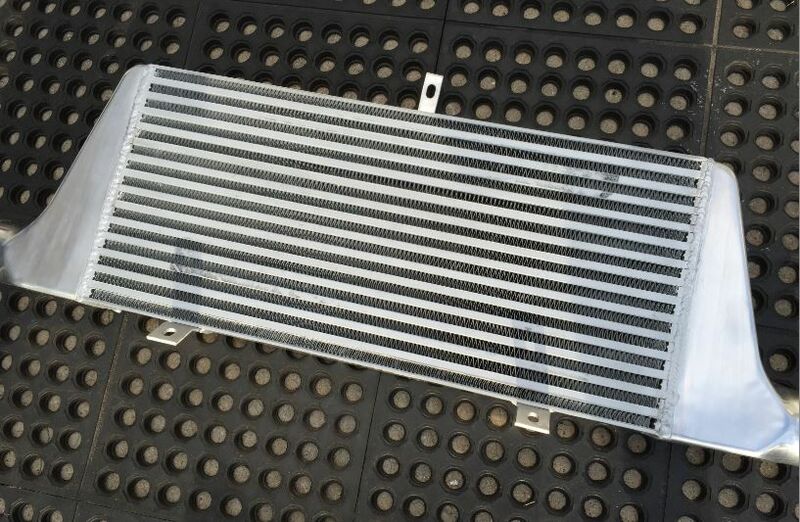 (1) SupraStore Custom Crafted 3" Deep Polished Intercooler for the 1993-1998 Supra Turbo. 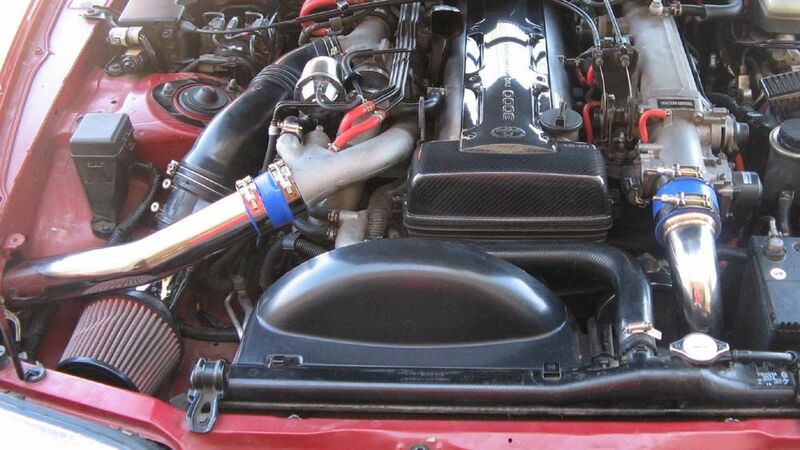 Uses standard Supra Turbo intercooler routing (as pictured). (1) Complete front mount intercooler radiator overflow relocation tank, cap, hose. Mark, what is the fitment like on this kit and have you installed one yourself? It fits very nicely, and yes, we've installed these and the fitment is great. As with any front mount kit for the Supra, you do have to slightly shift the power steering and A/C line a few millimeters (2 minute job), but that is it. What was most impressive in this kit? 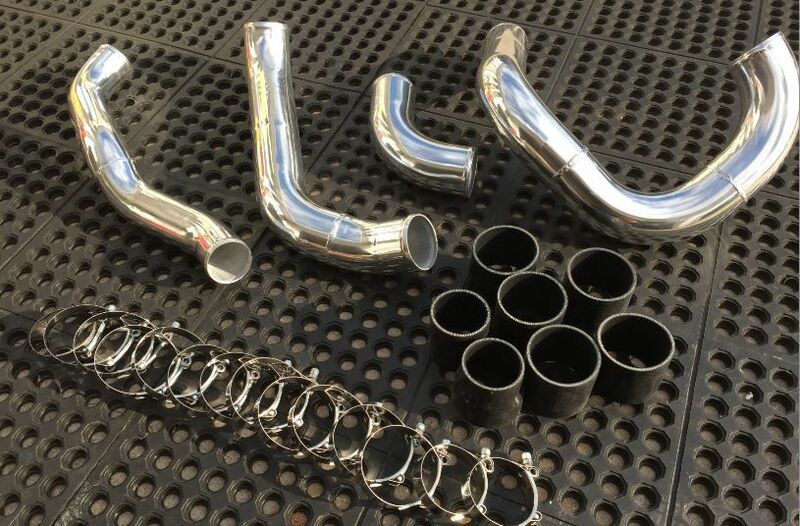 1) Quality of the front mount (polished, great welds) aluminum intercooler piping with T-Bolt clamps. 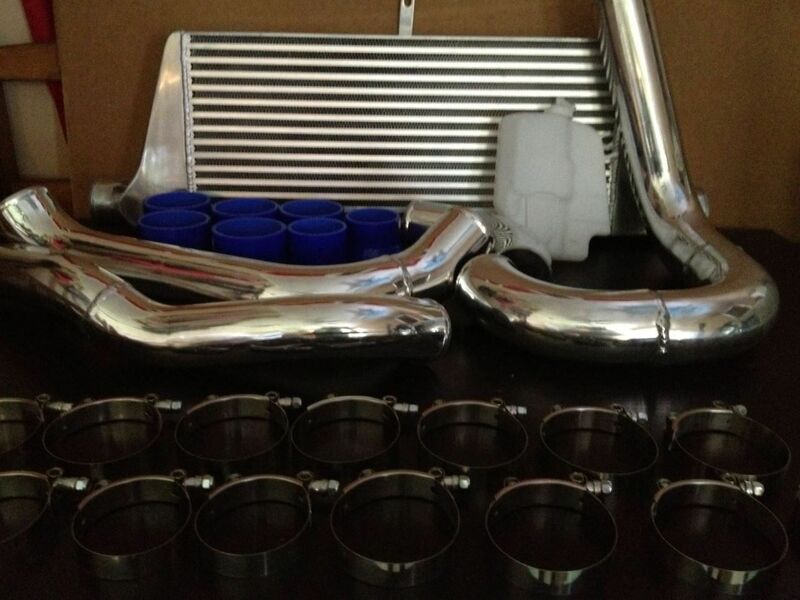 2) Radiator overflow kit included 3) Laser welds 4) Fitment and VALUE!! The engine bay picture shows blue couplers, but we only supply black now at the request of 90% of our customers. No other colors are available from us, but these are readily available on the aftermarket for those that wish to color match an engine bay. Internationally shipping applies to many Western European Nations as well as much of Australia (WA is extra). International please use drop down menu to select, to make the order process simple, for those shipping outside the USA. * FREE SHIPPING DETAILS: Applies to USA Lower 48 States Only. Everyone else, rock bottom shipping!